I don’t often shop at thrift stores. Or I didn’t until recently when I figured out how to truly rock thrift store shopping. I don’t enjoy shopping just to shop. Thrift store shopping can take a lot of time and you often have to really dig through a lot of junk to find good stuff. I’ve had better luck at some consignment stores but I felt like I could buy new things on sale for a similar price. Allergies. Thrift stores usually have a very distinct smell and can be very dusty. This bothers me a little and bothers Austin a lot, which meant he would never go with me. This is by far the most important tip of them all. Not all thrift stores are the same. Around here, whenever I’ve gone to a Goodwill, I’ve had to dig through piles of junk and their prices aren’t that great. I found a local thrift store that only stocks high quality items and has great prices. It has made all the difference! It’s also super clean, so I can bring Austin so that he can pick out clothes he needs too. Ask your friends, post a question on Facebook, and do a Google search for the best thrift stores in your city. A lot of thrift stores have certain items marked down even further, so don’t forget to glance at those. You can also ask if they have any regular sale days. There might be a day each week where you can get a percentage off if you’re a senior or a student. I check brands while I shop at thrift stores. Just because something is inexpensive doesn’t mean I don’t care if it falls apart. Clothes from stores like Forever 21 and Target are usually not made very well. They get worn out quickly and don’t wash well. If I find something super cute and ‘like new’ in a brand like that, I’ll pick it up but I try to pay more attention to clothing built to last. Brands like Banana Republic, LL Bean, or Ann Taylor are more durable and will last longer, especially considering that these things are already on to their second owner. It’s easy to shop somewhat carelessly at a thrift store and buy tons of stuff you don’t really need just because it’s cheap. I know a lot of people with closets overflowing but “it’s ok because it was only a few bucks each”. In my efforts to maintain a simple wardrobe, I only buy what I need and love when I shop at thrift stores. To do that, I shop with a general list of what I need. It doesn’t always work to look for super specific items because you never know what you’ll find. I make more of a general list of what to look for, and also make a mental note of what I don’t need. The last time I went, I knew that I needed to find a few pairs of shorts or capris of the summer. I also knew that I didn’t need any more pants or skirts, no matter how cute or cheap they were. In fact, I didn’t even look in those sections. Velma needs a few summer dresses in size medium. Shaggy needs shorts and dress clothes in size 3T. Always take a good look at the items you want to buy. Even at my favorite thrift store, I’ve come across clothing with stains and snags. 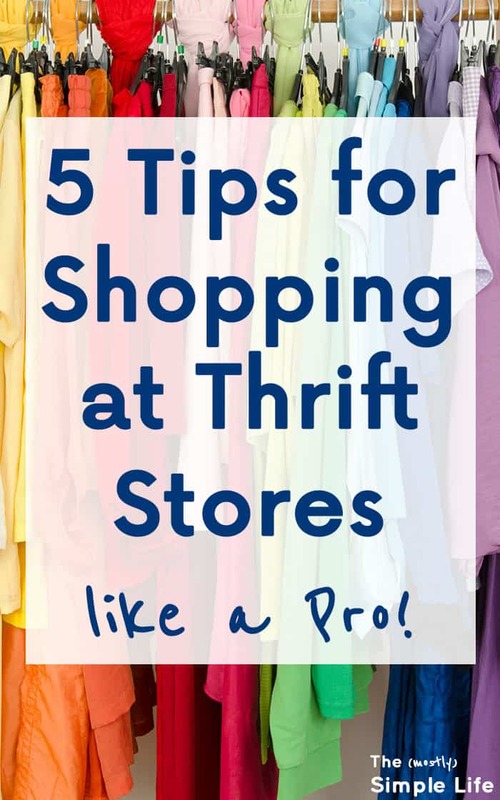 Since a lot of thrift stores don’t have good return policies, you want to be extra sure that what you buy is in good shape. Now that I’ve figured out some of these thrift store tricks, I enjoy thrift shopping! We have found some great clothes at amazing prices. I definitely think that tip #1 is the most important one, though. Finding a good thrift store can make a huge difference in what you can find, how much you pay, and how pleasant the experience is. ⇒ Tell me your thrift store tips! What’s the best deal you’ve ever found? Where is your favorite place to shop? I love thrift shopping, but like you said, all stores are not the same. We just got a new second-hand shop last week, and I cannot wait to go and see what they have to offer. A running list of things I would like to replace is a must! I tend to have squirrel brain when I go shopping, so having a list keeps things simple. How exciting! I hope it’s a good one! Thrift stores are great. However not everything is a bargain. One local store has started basing their prices on what they see items being sold for on eBay. While I understand that a thrift store is a money source for a charity. Most people so not go in to purchase items at antique store prices. That’s interesting Christina. I definitely go to a thrift store for a great deal, so I don’t think I’d be shopping there. I go to other stores for vintage, antique, or unique items. If you’re at all handy at altering clothing, my tip is to check the men’s section for women’s clothing and the women’s section for men’s clothing. First of all, they sometimes make mistakes when racking the clothing. Second of all, my husband really wanted a certain style of pants, but try as I might, I could not find any that fit his description in the men’s section. I went to the women’s section, and there they were! They just needed the hips taken in a bit (as women’s pants have a smaller waist as women have smaller waists than hips but men typically don’t), and they’re just what he was looking for!